Deferred Consumption: Fancy a mountain gorilla? Continuing our short series on the DR Congo, we’ll now detail some of their fabulous natural attractions in the east of the country. For context, Kishasa, the capitol and main commercial hub, lies in the extreme west of the country. Because of geography and DR Congo’s poor infrastructure, it’d be easier to access the eastern parts of Congo from Rwanda’s capital, Kigali, nearby. The main attraction in eastern Congo is the amazing natural scenery, best captured and concentrated in Virunga National Park (Africa’s first). While it encompasses several active volcanoes, the most exotic thing about it are its rare population of mountain gorillas. This is one of only three spots in the world where the endangered species can be found. 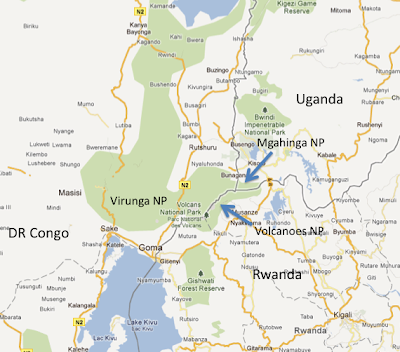 Their other two habitats are the nearby Volcanoes National Park in Rwanda and Mgahing National Park in southwest Uganda (see google map; image above is from here). 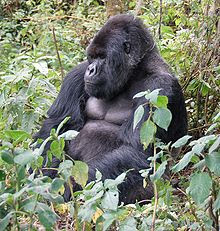 Around 480 (of the 790 worldwide) gorillas currently inhabit in the Congo park and these primates are deservedly considered critically endangered. Conservation efforts appear to be paying off, however, as the Virunga National Park has seen a ~ 26% increase in their gorilla population since 2003. Interestingly, according to this chart in Jared Diamond’s The Third Chimpanzee, the the common gorilla shares 99% of its DNA with humans and only 98% of it with the common chimp. These amazing creatures are thus more like us (genetically) than they are like the chimps. This only adds to the eerie beauty of these majestic animals. Virunga park, at 1.9m acres, is much larger than Glacier and Yosemite National Parks and just slightly smaller than Yellowstone, which is 2.2m acres. While the park was closed for several years during the Congolese wars (during which time several of the gorillas were shot), “during the last 3 years the park has seen remarkable regeneration, with heavy investment in tourism development, social infrastructure as well as safety. Currently over 3000 tourists a year visit the southern sector of Virunga National Park.” The tourists not only come for the mountain gorillas, but also for the high volcanic lakes and other wildlife, such as elephants, chimpanzees, giraffes, buffalo, and lowland gorillas. Sign me up.